Earlier this year Lancashire Music Hub appointed a new Music Director for one of its County Ensembles, Lancashire Youth Concert Band (LYCB), Gayle Coleman. Gayle brings a wealth of musical knowledge and extensive experience in working with young people. Gayle studied trumpet at the RNCM on the Undergraduate and Postgraduate courses under the tutelage of John Dickinson and John MacMurry; during her time there she performed for Hakan Hardenberger and alongside Alison Balsom at the International Trumpet Guild conference in 2002. She has performed with numerous orchestras including the Halle and has recorded with the BBC Philharmonic. Gayle is a strong believer in ‘grass roots’ music and set up a community band named Charnock Richard Brass in 2009 which is going from strength to strength in creating musical opportunities for the local community. 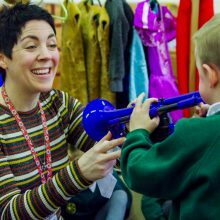 Gayle has worked for the Lancashire Music Service for the past 12 years and is the head of Chorley Music Centre and is leader of the demo group UpBeats who deliver Orchestral Music Workshops. Other than her work with Lancashire Gayle has recently been the assistant brass tutor with the National Youth Orchestra of Great Britain Inspire Brass residency. In her spare time Gayle enjoys walking the Wainwrights in the Lake District and volunteers for the charity, Contact The Elderly; helping to combat loneliness by organising regular tea parties for the older generation. as well as a collaborative gala concert with Chorley Music Centre and she is working towards a Band tour for Summer 2019! LYCB is also having a drop-in Open Day for new members on 28th April from 10am – 3.30pm – find out more here.